IEC-sites network is continuously growing across the nation by validating new sites that assure high quality imaging data and reporting. The goal of IEC is to achieve maximum quality throughout the process of acquiring, analyzing and evaluating images obtained for clinical trials. Our knowledge in medical imaging for clinical trials and efficiency, together with our flexible approach, has allowed IEC to act as a solid business partner to Pharma and CROs with more than 2,000 studies conducted to date and more than 20.000 image tests per year performed to patients. Site survey and Phantom’s requirements are immediately sent to sponsors. Prompt response to SIV, TKONs and contracts. 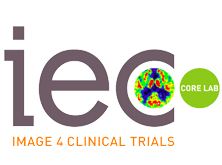 A cloud platform where every study coordinator from different sites can program the imaging test needed for each patient. Our Physicians are trained to detect any inconsistency in image quality and/or clinical reports. All the imaging tests performed are re-evaluated and incorporated into a customized follow-up table as determined in each protocol. Imaging Biomarkers can also be obtained if requested by clinicians or sponsors. The IEC team has extensive experience with all programs used. All images are forwarded daily to the sponsor. All Physicians, study coordinators, nurses and datamanagers have IEC’s direct contact details. The first Spanish lab focused on high quality results, image data analysis and reporting for national and international trials.